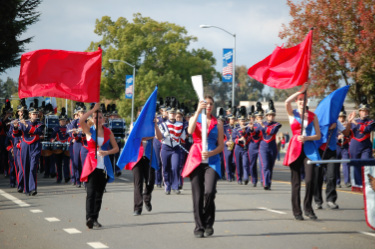 The Color Guard is an integral part of our marching band program at Pleasant Grove High School. Members of this group meet after school to learn and practice the routines which are incorporated into our field shows and parades. The Color Guard also competes in the NCBA Winter Guard Competition Circuit during the winter season. The PGHS Winter Guard team was the the Novice Division Champion at the 2011 NCBA Championship Competition. The program is open to all interested students of PGHS. Please contact us at PGHSBandBoosters@gmail.com if interested in joining.